NSO Sample Papers 2018 are the previous year papers which help students for better preparation of the exam. NSO 2018 will be conducted on two levels. NSO level 1 will be conducted on 1, 15 and 27 November 2018, while level 2 will be held in February. Candidates qualifying in NSO 2018 level 1 will be eligible to appear for level 2. Aspirants from Class 1 to 12 appearing for National Science Olympiad (NSO) must be aware of the exam pattern, syllabus among other details. Therefore, it is important to practice through NSO exam sample papers to enhance the preparation strategy. NSO sample papers 2018 contain questions from the previous year question papers and mock tests. With regular practice of National science olympiad question papers, students can know the exam pattern, types of questions, marking scheme and format of the exam. Candidates can also analyze their preparation strategy and work on their weakness. 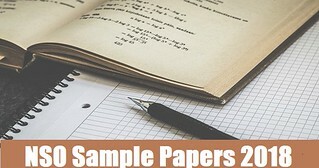 Read the article NSO sample papers 2018, download sample papers in PDF format, and benefits of papers. To qualify in NSO 2018, experts suggest practicing through NSO exam sample papers for level 1 and 2. The National science olympiad question papers are made available by SOF. Aspirants can practice as much as they can through NSO sample papers 2018. Solving sample papers will help students to understand the type of questions being asked, exam pattern and also analyze the preparation. Students can download the sample papers from here. NSO sample papers are available in the table given below. NSO Sample Papers are available for Class 1 to 12. Students can download NSO sample paper for their class and practice it to understand the type of questions asked, exam structure and also analyze their performance. Students can easily download the class wise National science olympiad question papers by following the links given in the table below. Section 1: Spatial Understanding, Grouping, Measuring Units, Analogy, Geometrical Shapes, Patterns, Odd One Out, Ranking Test. Section 2: Living and Non-living things, Plants, Animals, Human Beings and Their Needs, Good Habits and Safety Rules, Air and Water, Weather and The Sky. Section 3: Higher Order Thinking Questions - Syllabus as per Section 2. Section 1: Patterns, Measuring Units, Odd One Out, Series Completion, Geometrical Shapes, Analogy, Ranking Test, Grouping of Figures, Coding-Decoding, Embedded Figures. Section 2: Plants, Animals, Human Body, Food, Housing and Clothing, Family and Festivals, Occupations, Good Habits and Safety Rules, Transport and Communication, Air, Water and Rocks, Earth and Universe. Section 1: Patterns, Analogy and Classification, Coding-Decoding, Mirror Images, Embedded Figures, Alphabet Test, Ranking Test, Grouping of Figures, Figure Matrix, Geometrical Shapes, Days and Dates & Possible Combinations. Section 2: Plants and Animals, Birds, Food, Housing and Clothing, Transport and Communication, Human Body, Earth and Universe, Matter and Materials, Light, Sound and Force, Our Environment. Section 1: Patterns, Alphabet Test, Coding-Decoding, Mirror Images, Embedded Figures, Geometrical Shapes and Solids, Ranking Test, Direction Sense Test, Days and Dates & Possible Combinations, Analogy and Classification. Section 2: Plants, Animals, Food and Digestion, Clothing, Matter and Materials, Force, Work and Energy, Our Environment, Earth and Universe. Sense Test, Ranking Test, Alphabet Test and Logical Sequence of Words, Puzzle Test. Section 2: Motion and Measurement of Distances, Light, Shadows and Reflections, Electricity and Circuits, Fun with Magnets, Our Environment (Water, Air Around us, Garbage in Garbage out), Sorting and Separation of Materials, Changes Around Us, The World of Living (Characteristics of Living Beings, Parts of Plants, Body Movements in Animals and Adaptation), Food and its Components, Fibre to Fabric. Animals, Reproduction in Plants, Natural Resources and Their Conservation (Soil, Water: A Precious Resource, Forests our Lifeline, Wastewater Story). Some Natural Phenomena, Light, Stars and the Solar System, Pollution of Air and Water. Section 2: Motion, Force and Laws of Motion, Gravitation, Work and Energy, Sound, Matter in Our Surroundings, Is Matter Around Us Pure, Atoms and Molecules, Structure of Atom, Cell-The Fundamental Unit of Life, Tissues, Diversity in Living Organisms, Why Do We Fall III, Natural Resources, Improvement in Food Resources. Electricity, Magnetic Effects of Electric Current, Sources of Energy, Our Environment and Its Management. Physics: Units and Measurements, Mechanics, Properties of Matter, Heat and Thermodynamics, Oscillations, Waves. (Groups 13 and 14), Organic Chemistry - Some Basic Principles and Techniques, Hydrocarbons, Environmental Chemistry. Section 2: Higher Order Thinking Questions - Syllabus as per Section – 1. Biology: Diversity in the Living World, Structural Organisation in Plants and Animals, Cell: Structure and Functions, Plant Physiology, Human Physiology. Physics: Electricity and Magnetism, Electromagnetic Induction, Alternating current, Electromagnetic waves, Optics, Modern Physics, Semiconductor Electronics, Communication Systems. Chemistry: Solid State, Solutions, Electrochemistry, Chemical Kinetics, Surface Chemistry, General Principles and Processes of Isolation of Elements, p-Block Elements (Group 15 to 18), d- & f-Block Elements, Coordination Compounds, Haloalkanes and Haloarenes, Alcohols, Phenols and Ethers, Aldehydes, Ketones and Carboxylic Acids, Amines, Biomolecules, Polymers, Chemistry in Everyday Life. Biology: Reproduction, Genetics and Evolution, Biology in Human Welfare, Biotechnology, Ecology. Along with the NSO sample papers, it is important for aspirants to practice the National science olympiad question papers of the previous years to know the strategy, exam type and difficulty level of papers. Students can also get NSO study material recommended by SOF on their website. NSO previous year question papers and study material will help students prepare well and gain confidence for the Olympiad. For any queries related to NSO Sample Papers, you can write to us in the comments section below.